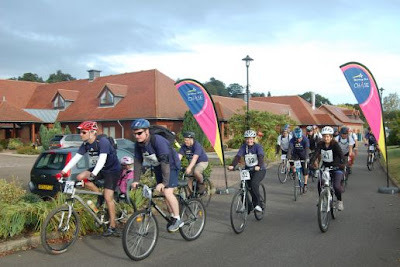 I am emailing to ask you to help us spread the word of the Hospice to Hospice Bike Ride which is back for its second year, with new and exciting routes, including the cycling mecca, Box Hill! All we ask you do is forward this email to your club members and display the attached poster on your club noticeboard. At Shooting Star CHASE, the families we support have to face very difficult situations. They all have a child or a teenager who is not expected to reach their 19th birthday. We are committed to caring for these families; we are there for every step of their journey, sharing the good times, and helping them through the tough times with practical and emotional support. With no guaranteed government funding we must raise £23,000 a day to continue our vital service. The annual Hospice to Hospice Bike Ride will take place on Sunday 29th September. No matter what your fitness level, you can choose your challenge – cycle 70, 50, or 20 miles. This year, the bike ride will be starting and finishing at the beautiful Painshill Park, Cobham. Entry fees include a t-shirt, training information and advice, refreshments along the route, commemorative medal and the opportunity to start and finish within Painshill Park. This event is a great opportunity for friends, family, colleagues, or club buddies to get together, enjoy a great experience and raise money for a very special local cause! or call us on 01932 823100.